Mostly wooded (hardwood canopy), with lots of elevation. Water comes into play a couple of holes but easily navigated. Four holes are wide open pastures to provide a nice change of pace. Multiple pin placements and many holes have dual tees. #1 (of this East course) and #19 (West course) both start at the main parking lot (Upper Plantation Parking lot). A billboard in the main parking lot by #1 shows the current layout. I-295 W/E to exit 8, take Rte 332 West (Newtown Bypass). At 3.2 miles it becomes Rte. 413 North, 1.7 miles more to park entrance on left. Turn in, follow road to stop sign, go right, then 1st left into parking lot. Course in woods on left. Outstanding course to play on. Great job by the BCDGA in setting it up and continued maintenance of it. I'd give this course a 5 ...but as the Grounds Keeper, I feel there is room for improvement. This course gets a lot of play, but remains one of the cleanest well maintained I've ever played on. Designed by the "Technical" mind of Joe Mela this course really does have it all. When all the holes are in the long "C" position it is one of the toughest courses on the Eastern seaboard. Benches, Bag Hangers, Tee and Next tee signs, make this course a pleasure to play. Several elevated pins and water/elevation make every shot a "thought provoking moment". 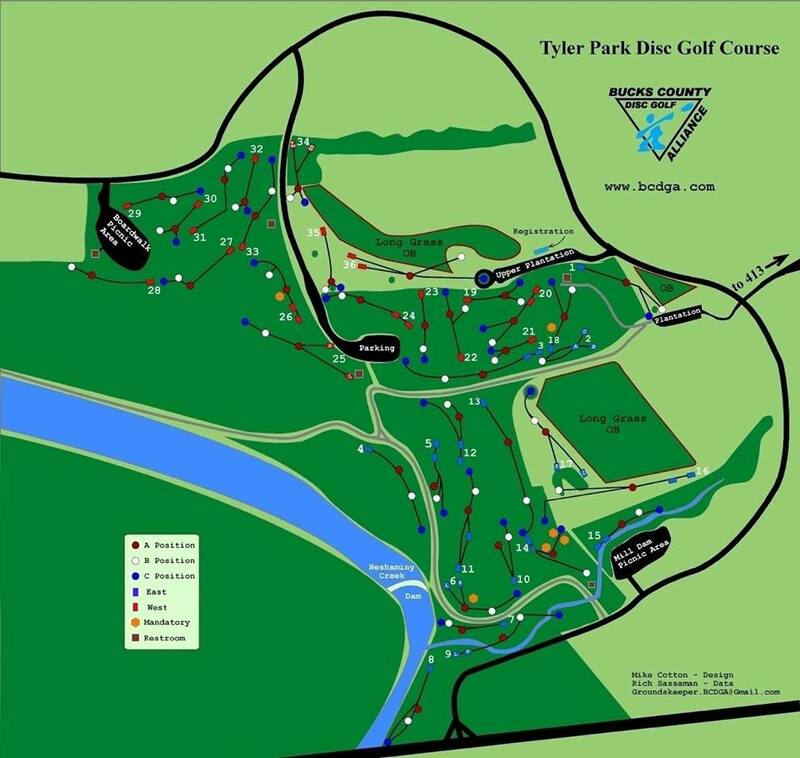 The Local club (Bucks County Disc Golf Alliance - BCDGA) has an outstanding relationship with the Tyler State Park Management, Rangers/Police, and Maintenence. The BCDGA runs some of the finest disc golf events including clinics for women, kids, and beginners. Play it and you'll be hooked.